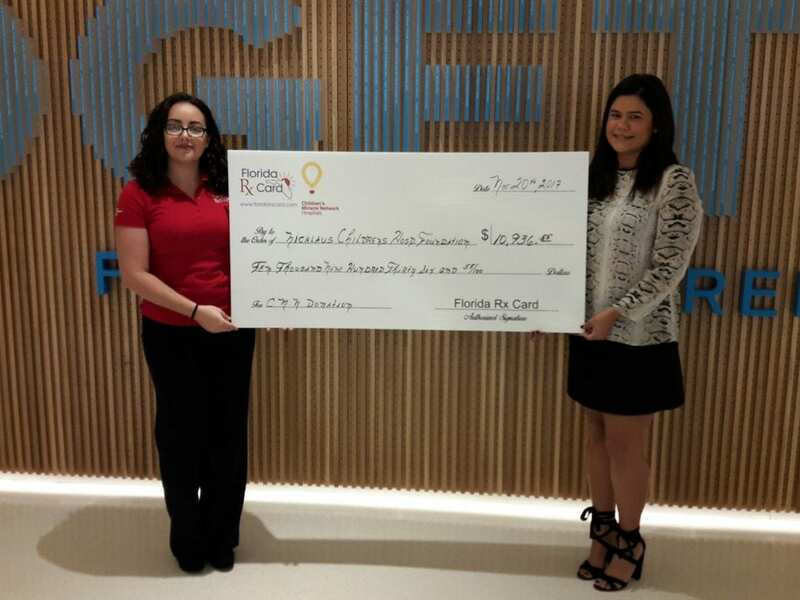 On November 20, 2017, Adrianna Habash, Florida Rx Card Representative, presented a check to Nicklaus Children’s Hospital Foundation. Jessica Rummel, Development Associate, was pleased to receive the check donation in the amount of $10,936.55. After the presentation, Adrianna was given a tour of the hospital and also provided a cake and arts & crafts items for Jessica to share with the children in coming months. Adrianna and Jessica will continue to work together to raise awareness for the Florida Rx Card and CMN relationship that will help increase donations to Nicklaus Children’s Hospital Foundation. Remember that each time a prescription is processed using Florida Rx Card, a donation will be made to your local CMN hospital. Since 2015, the United Networks of America partnership with Children’s Miracle Network Hospitals has raised over $2.4 million dollars for local children’s hospitals. Of this, $10,936.55 has been raised for Nicklaus Children’s Hospital Foundation.